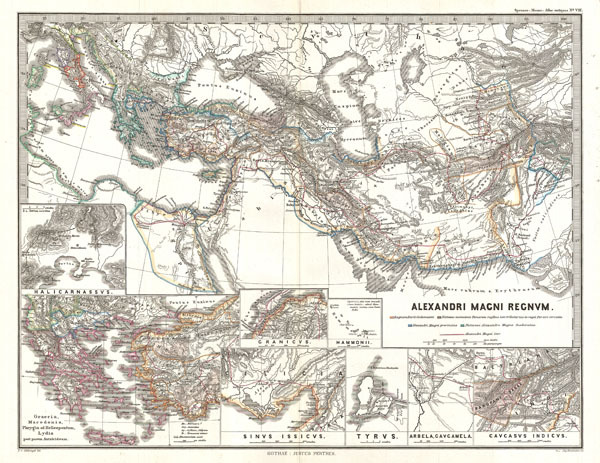 A fascinating 1854 historical map of the Empire of Alexander the Great. Shows Alexander's conquests at their fullest extent covering from Italy to the mouths of the Indus River and from the Black Sea to the Nile Valley. A series of insets in the lower quadrants of the map depict various sites associated with Alexander's most important battles, including Halicarnassus, Sinus Issicus, Cranicus, Hammonii, Tyrus (Tyre), Arbela, Gavcamela, and Caucasus Indicus. A further inset in the lower left quadrant details Greece, Macedonia, and the Aegean. The overall style of this map is typical of German cartographic work form the middle part of the 19th century. It is characterized by high quality woven papers, extremely fine steel plate engraving work, high levels of detail, and minimal but intense outline-style color work. Drawn by A. Hanemann and F. von Stulpnagel and published by Justus Perthes in Karl von Spruner's 1854 Hand Atlas. Spruner, Karl von, Historisch-Geographischer Hand-Atlas zur Geschichte der Staaten Europa's von Anfang des Mittelalters Bis Auf Dies Neueste Zeit, (Gotha, Justus Perthes) 1854. Rumsey 1626.008. Phillips (Atlases) 3288. Espenhorst, J., Petermann's Planet, p. 397-404. Espenhorst, J. Andree, Stieler, Meyer & Co., p. 148.